Johannesburg - The C-word – comeback, not the other one – has been the watch word for Proteas fast bowlers this season, what with Dale Steyn, ­Vernon Philander and Lungi Ngidi all back rebuilding their careers on the domestic scene. With Steyn and Philander on the wrong side of 30, Ngidi’s comeback could well be more important in the long run given the fact that he’s still only 21 and, all things being equal, will probably play a meaningful role in the 2019 World Cup. Not that Ngidi, who announced himself in stunning fashion playing T20 cricket for the Proteas earlier this year, has such lofty ambitions at the moment. The lower back ­injury that saw him withdraw from the South African A tour in June was already his second, so his goals are more about seeing the season through. “I’d like to play a full franchise season and go through the whole process,” he said a few days ago. “Doing that would give me the confidence to play in all three formats and, putting in performances, maybe in future I can earn a call-up to the Proteas again". The four months away were spent fruitfully: “Like my coach explained, I went from playing varsity cricket to the South Africa A team within a year and the intensity was different. My body wasn’t strong enough to take the workloads I was putting in because I hadn’t had time to focus on proper conditioning. “In a way, I’m glad it [the injury] happened ­because I learnt that if I want a long career, I’m ­going to have to do the small things right. “I’ve also had to adjust my lifestyle with things like changing my diet and basically adjusting to being a professional sportsman". The early results have been nothing short of sensational, with Ngidi taking career best figures of 6/37 in his return first-class game against the Lions, and following that up by revising his best domestic T20 figures to 4/14 against the Warriors. “It’s been a gradual build-up. 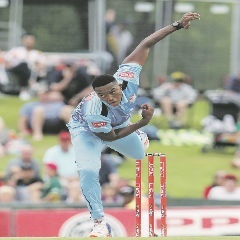 I’m happy with how our trainer and physio have managed it,” said Ngidi. “I started by playing amateur cricket bowling 12 or 13. At franchise level, I’ve been bowling 16-plus overs a day. “The workload was a lot more than I’m used to, but I’ve handled it well and had no fatigue and I think it showed in my first game. The numbers I want to reach are 20 overs a day and still feel strong at the end of the day". The 1.90m tall, 95kg Ngidi said he was feeling at his best physically. “This is the strongest I’ve ever felt; I feel light on my feet. But I’m still coming back so the pace is still an issue. As a quick bowler, you want to hit 140km/h on average". Despite this already being his ­second back injury, Ngidi said he didn’t worry about whether he would return to the game. “I knew I’d be back and that it would just be a matter of when,” he said. “It didn’t affect me to the point of where I thought it was the end of my career. I was supposed to play in the T20 series against ­England, which I felt was a great chance to showcase what I could do against a great team. “I was upset that I wasn’t playing cricket, but it was always a matter of when I’d be back, not if. Also, to come back and reap the rewards of the hard work has been a good boost in terms of my confidence".